Is the worst over for CIMB? 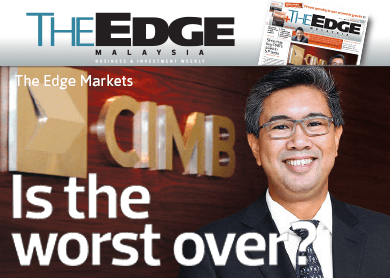 KUALA LUMPUR (March 14): The Edge weekly in its latest edition spoke with CIMB Group Holdings Bhd’s newly confirmed group chief executive Tengku Datuk Zafrul Aziz on the outlook and direction of the country’s second largest banking group. In an exclusive interview with the Edge’s Joyce Goh and Adeline Paul Raj, Zafrul said that the worst was over for the banking giant. The Edge reported that one of the tough decisions Zafrul had to make with his team was to close down CIMB’s Australian business and cut jobs in Hong Kong, Taiwan and Singapore, where a total of 168 people were laid off. The weekly quoted Zafrul as saying that the review was ongoing and that CIMB would continue to do it to achieve its targets. The Edge said that CIMB, which was once a trailblazer in banking, was now one of the weaker performers in the industry. The magazine said CIMB’s earnings had been declining for the last three consecutive quarters and it recently announced its worst quarter yet in terms of return on equity (ROE), achieving only 0.64% in its fourth quarter ended Dec 31, 2014 (4Q2014). The Edge reported Zafrul as saying that the last six months as being very hectic, as CIMB weighed a potential merger with RHB Capital Bhd and Malaysia Building Society Bhd that failed to materialise. It quoted Zafrul as saying that since the merger did not take place, the banking group was now focused on its mid-term strategy (T18). “We’ve also reinvigorated our organisational structure and interlaced a mixture of new blood and experience in the new management line-up,” it quoted Zafrul as saying in his first interview since officially taking on the top job on Feb 27. “We announced our results — not our best — but at the same time, we bulked up our capital base significantly and have outlined some very clear plans to move the firm forward with T18. All in all, I am optimistic and the task now is to focus on executing our plans,” said Zafrul. CIMB saw its net profit fall 81% year on year to RM200.3 million in 4Q2014, mainly due to higher corporate banking loan impairments in Indonesia and Malaysia as well as a loss-making wholesale banking division. Allowance made for impairment losses on loans, advances and financing almost tripled to RM919.2 million from RM308.5 million a year ago. Revenue dropped marginally by 3% y-o-y to RM3.67 billion. For the full year, CIMB saw its net profit drop 31.6% to RM3.1 billion in 2014 from RM4.54 billion a year earlier. Allowance made for impairment losses, advances and financing jumped 131% y-o-y to a whopping RM1.52 billion. The group’s annualised FY2014 ROE was 9.2%, in stark contrast to the 15.5% achieved in FY2013. Despite the tougher environment, CIMB’s rivals like Malayan Banking Bhd (Maybank) and RHB Capital managed to grow their earnings last year. Maybank’s net profit grew a marginal 3% to RM6.72 billion while RHB Capital’s rose 11.5% to RM2.04 billion. Zafrul says CIMB fared worse because it had the biggest exposure to the Indonesian market and a larger investment banking (IB) franchise regionally compared with the other local banks. The Edge said that apart from battling a highly competitive market, which was eating into its profit, CIMB was facing another conundrum, on its talent front. Kenny Kim. Lee and Kim, who were with the group for many years and were among former group CEO Datuk Seri Nazir Razak’s trusted lieutenants, are now in advisory roles. Lee will also become a board member. “We have a strong second layer to move up. A few changes have already been announced and for CIMB, it is a big thing. I don’t think we have done such a major reshuffling in the last 10 years,” Zafrul comments. Just last week, CIMB announced more changes to its senior management team that saw Tigor M Siahaan nominated as president director of CIMB Niaga and the appointment of Effendy Shahul Hamid as CEO of group asset management and investments and Kwan Keen Yew as group chief compliance officer. Indeed, all eyes are on Zafrul to see how soon he can deliver CIMB from this difficult period and get it into the next and more challenging phase of its journey.